Manchester United 1; Manchester City 6. Such an astonishing scoreline that there's no other way to begin this post. It was the long awaited clash of the top two in the Premier League; the established empire, in champions Manchester United against the nouveau riche upstarts, Manchester City - given the moniker of "noisy neighbours" by United manager Sir Alex Ferguson. They have been the sides that have looked the class in English football's top division, and have caused some to dub Manchester as England's new "capital of football". United started the match as narrow favourites, and played as such in the early stages, dominating possession. Ashley Young looked especially threatening, and City needed all their defensive nous to keep the score at 0-0. Then came the first of three key moments, which determined the final outcome. David Silva - in tandem with James Milner - worked himself into space down the left, before cutting the ball back for Mario Balotelli. The Italian opened his body and finished with aplomb into the far corner, before revealing a T-Shirt alluding to his recent troubles off the pitch. Despite being labelled as football's "enfant-terrible", it remains a truism that nothing silences negative headlines more than playing well. And after producing lacklustre performances last season, Balotelli has shone for City in recent weeks. His goal was a continuation of his good recent form, and he wasn't done there. Exchanging passes with Sergio Aguero, he broke clear on goal, and was hauled down by Jonny Evans. Referee Mark Clattenburg (who had a superb match) was left with no option than to send the Northern Irishman off. United were now down to 10 men. This was key moment #2. With Evans now gone, United were increasingly open in defence, making it easier for City to threaten when attacking. However, the home side had a good 15 minute spell, making me wonder if they were actually more likely to equalise rather than City score a second. But the combination of Silva and Milner opened United up again. Micah Richards also deserves credit for his part in the move that ended with Balotelli tapping in Milner's cross to make it it 2-0. That was key moment #3. City now had complete control; a two goal lead and a man advantage. That was the contest over, now for the humiliation. 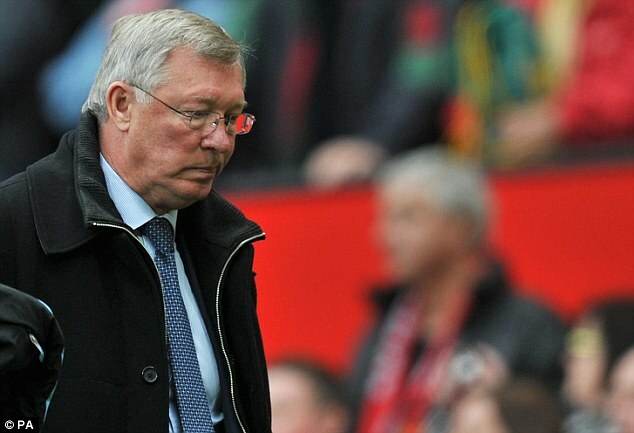 In his post-match comments, Ferguson bemoaned his team's naivete in defence. They continued to attack with wanton abandon, leaving gaping holes at the back. It was like watching a guileless baby deer bounding aimlessly into a pack of ravenous wolves. With Silva, Milner and Richards causing havoc when City attacked - especially down the right-hand side - Aguero, Silva, and Edin Dzeko (twice) turned 2-0 into 6-1 (United's only respite being a super goal from Darren Fletcher). This was a brilliant performance from City. David Silva has been the best player the Premier League thus far, and was a constant menace - his pass for Dzeko's second goal being the champagne moment of the season. James Milner was also superb, allying his work-rate and industry with real intelligence and technical skill. For me, he's been the most productive player in English football over the past seven days. Micah Richards had a great second-half, playing more like a buccaneering wing-back as Patrice Evra was overwhelmed. We should also give a special mention to the shop floor men; Vincent Kompany, Joleon Lescott, Yaya Toure and Gareth Barry, who all did a fine job of constructing a sky-blue shield to protect their goal from United's early attacks in the first-half. Who knows what would have happened if the Red Devils had turned their early pressure into goals. But Ferguson was right about how his side defending. It bore remarkable comparisons to the Arsenal defensive display when they took an 8-2 hammering against United earlier in the season. They seemed to forget that it's all well and good to have an attacking strategy, but it counts for naught if you don't have the ball. Not only was United's passing woeful, but when they lost possession, they seemed to pay lip service to the most basic tenets of how to defend. The full-backs pushed forward, playing like wingers. There was no midfield screen in front of the back four. It left United with only two players defending for a lot of the second half. And with City counter-attacking with three players, sometimes more, it stands to reason that the final score was so lopsided. I wrote at the start of the month that United were playing like laughing cavaliers, and that this strategy had a limited shelf-life. We saw the extent of those limits today. They have now conceded 91 shots on their goal in only five league games at Old Trafford. It doesn't matter how fearsome you are in attack. Success is not sustainable if you're allowing your opponents to have so many scoring opportunites. They've had rotten luck with injuries and the return of skipper Nemanja Vidic should help plug the holes in defence, but a result like this has been in the post for a few weeks now. This brand-new, free-flowing, exuberant young United team looked like the titular emperor in the fairytale, The Emperor's New Clothes, hubristically believing that victory will be theirs by divine right. And they've had good reason to think this. Until Sunday, they'd played sides who lacked the belief that they could defeat the all-conquering Champions. Teams like Norwich and West Brom are accomplished outfits, but clearly suffered from the belief that they're no more than mid-table fodder when they came up against United. City have no such inferiority complex, and went about their task with professionalism, skill and ruthlessness. If Norwich and West Brom were the peasants who kowtowed to the Emperor, not saying a word as he paraded naked through the streets of his kingdom, City were the fearless child, who shouted, "The Emperor has no clothes on!" In the fairytale, the Emperor's folly led to him running back to this castle in abject humiliation, with the mocking laughter of his subjects ringing in his ears. I think you can connect the footballing analogy from here. - The incredible result of the Manchester derby has raised an curious issue in the Premier League this season. Are the defences in England's top flight worse than ever before? It's not even November and look at some of the crushing scorelines we've seen; Manchester United 8-2 Arsenal, Chelsea 5-1 Bolton, Bolton 0-5 Manchester United, Manchester City 4-0 Swansea, Manchester City 5-1 Tottenham, Tottenham 4-0 Liverpool. Teams like Tottenham and Manchester United have both dished out beatings, and also been on the receiving end of thumpings, so it's clear that it's not just the clubs fighting relegation that are bringing down the overall standard of defending. I've alluded to United being inspired to play more like Barcelona. With the Catalans as the world's finest club side, and the Spain national team the current World and European champions, it makes sense to try and take aspects from their footballing culture to improve our own. Unfortunately it's also seemed to have affected the general quality of defending. At the moment, there only seems to be two genuinely good defensive sides in the Premier League; Manchester City, and the team who have the best defensive record in the top flight; Newcastle United. - In the midsts of the incredible Sunday of football, we shouldn't forget that Rugby Union has crowned new World Champions in New Zealand. The All Blacks came through a bruising encounter against France to win a nail-biting match, 8-7. The significance of this should not be underestimated. Even though it's only sport, it's not far off being an important moment in the history of New Zealand. Like ice-hockey in Canada, football in Brazil, or cricket in India, the success of the country in their national sport links to the very psyche to a large portion of the country's population. Other nation's rugby players represent England, Scotland or Australia, If you play for New Zealand, then you don't just represent New Zealand. You are an All Black. The very name conjures up different connotations. Like being called up to an elite fighting force, being an All Black holds a profound resonance. And this has only caused the pain of perennial failure to be a psychological wound that has festered with every World Cup since 1987. After winning the inaugural competition, New Zealand have since failed to take the coveted title of world champions. It's a drought that have led many to proclaim the All Blacks as sport's greatest chokers. The joke about them "peaking between World Cups" has been told so often as to become a tired cliche. This time, with the tournament in their own country, and New Zealand as hot favourites yet again, there was no excuse. The home support demanded nothing less than success this time around. And yet we all know what can happen to the best laid plans. Midway through the tournament, disaster befell the squad as Dan Carter was forced to withdraw after an innocuous training injury. Carter has been rugby's marquee name for over four years. A fly-half who ticks every box, and the key component in the team. A New Zealand team sans Carter was an unthinkable prospect. Many pundits said that head coach Graham Henry would now pay the price for not having a contingency plan in Carter's absence. Colin Slade was brought into the spotlight to replace Carter. But not for very long. Slade soon picked up an injury of his own, and Henry was forced to rely on third choice fly-half, Aaron Cruden in yesterday's final. Surely New Zealand's injury curse was over and they could focus on ending a yearning that has lasted for 24 years. Well, in the 33rd minute, Cruden was left on the floor after hyper-extending his knee in a tackle. After trying to stand, it was clear he couldn't continue and had to be helped off the pitch. It was left to fourth choice, Stephen Donald to make his World Cup debut in the competition's most important game. Lest we forget, captain Richie McCaw was also playing injured, his ankle being held together by little more than glue. With Carter gone, McCaw was New Zealand's last remaining talisman, and he led his side admirably as their 8-0 lead was cut to 8-7 by a game French side. In the end, rather than be overawed by the occasion, it was Donald who kicked the decisive penalty that gave the All Blacks the William Webb Ellis trophy. Donald should be lauded as he easily could have left the kicking duties to Piri Weepu, despite the scrum-half missing with three attempts in the first half. But Donald didn't shirk the spotlight, and took the opportunity to make himself a national hero. And after a tragic last 12 months for New Zealand as a nation; the earthquakes in Christchurch and Canterbury, as well as the accident the Pike River mine, this was an apposite time for the country to have something to cheer. Winning the World Cup will never compensate for the physical and emotional damage caused by those tragedies, but we shouldn't underestimate the power of sport to raise morale and bring hope to people in arduous times. And after such a long wait to take their place at the top of rugby union's mountain, I think no impartial observer could object to the All Blacks finally having their day in the sun. - Finally, despite the myriad of sporting entertainment on show this weekend, we should not forget that it was laden with tragedy as yet another death befell the arena of motorsport. In the Moto GP race in Malaysia, rider Marco Simoncelli crashed out of the race and sadly passed away. I'm not going to go in the details of the accident, and I'm certainly not going to post any links to the crash - unlike some more ostensibly reputable publications. But we should remember that while motorsport is something that carries a high element of risk, it makes it no less tragic when it comes at the expense of a life. It'd be remiss of me to ignore the fact that these men and women compete not only against each other, but against the looming spectre of mortality, which rather than be a turn-off for people, adds an extra scintilla of interest to the viewing experience. But that should always be offset by the fact is that sport should never be anything more than harmless fun, a silly diversion from the things in life that really are important. And when the adult gravity of life and death encroaches on the childish playtime that is the world of sport, it is the most poignant and unwelcome of intrusions. Regarding motorsport. Well worded indeed sir though I would interject on one point. We do not deny that watching these people put their lives on the line gives us a great amount of enjoyment to observe. I think, more so in the case of motorsport, the participants would argue that the reason for them doing it is not to entertain. Its a stage on which to throw down against the best in the field and prove to yourself that you can compete at that level. They do it simply for the love of the experience. The thrill the adrenaline which of course is only really derived from the aspect of cheating death that it inherent to the sport. If these people were not the best we would have no idea who they were, but I guarantee you that they would be out there on a track racing somehow some way. The fact that they are on our screens doing it simply means that they have reached the top of the pile and there are only a few left to beat. Of course this does not excuse our desire to watch them risk their lives, but I for one do not watch it for that. I watch it like I do any other sport, to see highly dedicated and skilled individuals do their utmost to be the very best. When distaster like this strikes It is horrible and tragic, but in a way I envy those who fall in battle. It is an honourable way to go and to die doing what you love is a privilege, I have always said that I wanted to go that way, the shame is for those left behind and the loss of a great personality in the sport. Guy Martin (star of TT 3D) has a very interesting approach to this, in that he forms no close attachments personally, as what he does is ultimately selfish. I guess my overall point is: If I were that good I would be there, every session doing what I Ioved, trying to be the best and knowing the risks. If you all wanted to watch me do it then I would welcome you along but if I died in the process, I would want you to know that it was a hell of a way to go. Good quality officiating in the Manchester Derby, granted, and generally more restrained than you might think if you just looked at the stat sheet and scoreline. However, I think there was a big miss on the Patrice Evra call late in the game. You would definitely allow the advantage to City after the foul that did draw the yellow card, and that means Evra's foul also would have "counted" and merited his second yellow card, too. So, I'll praise the officials for making sure that no one could claim any anti-United bias (as if that would ever happen at Old Trafford anyone). Still, though, United are very very fortunate that they aren't down two defenders to suspension next week. They should be.